Over the past 20 years, behavioural economics has identified factors that influence and determine how people behave, including alternative decision-making pathways and many cognitive biases and heuristics. Taking account of these helps to build a clear view of how healthcare customers think and behave in relation to your product in the real world. 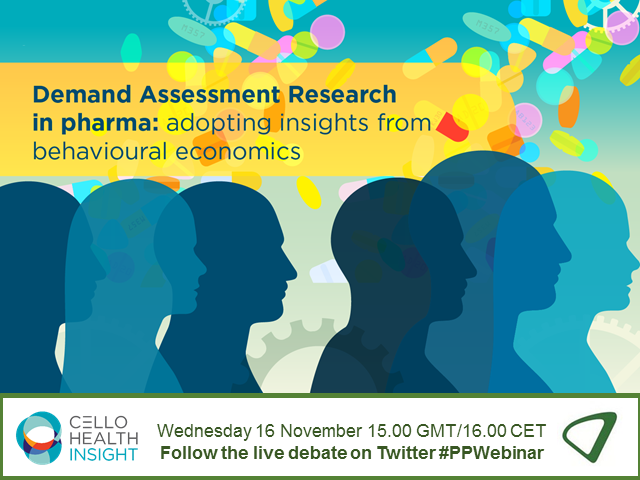 This short masterclass explores ‘quantitative demand assessment research’ – what it is and how insights from behavioural economics can improve the application of this important tool in pharmaceutical market research. •Highlight a range of techniques using behavioural economics that help you build a more accurate picture of your customers and market. Brexit uncertainty isn’t going away any time soon – but it’s important to remember that the UK government has already set out two plans for the future shape of the country’s healthcare industry: the second Life Sciences Sector Deal and the long-term plan for the NHS. With these two plans in place there are plenty of opportunities for the industry and the government to work together to keep the UK at the top of the international life sciences sector – and perhaps reach even greater heights. This pharmaphorum webinar, held in partnership with IQVIA, will analyse the current and future landscape for UK life sciences as well as what steps have been taken so far to boost the sector. Panellists from across the industry will look at the challenges presented by the current situation with Brexit and how the 10-Year Plan and the Sector Deal 2 (or 2018) play into this. They will discuss the positive steps taken by the government to prepare NHS innovation for a radically different future and make sure the UK remains an attractive location for ongoing inward investment from global pharma. The prevalence of cancer is currently predicted to be higher than ever. Current statistics show 1 in 2 people in the UK and 1 in 2 men/1 in 3 women in the US will experience it at some stage in their lives. And yet the picture for patients is an improving one. The move towards immunotherapies heralds much promise and this is potentially just the beginning. As cancer is understood increasingly not by type, or even tumour type but specific mutation the era of personalised oncological therapies is visible. To delve further into this pharmaphorum is pleased to present an exclusive online discussion. Bringing together experts at the cutting edge of this field it aims to interrogate where we are in terms of this shift towards personalised oncology, what this means in terms of the development pathway and looks at the approaches which could (and will) fully evolve the way that cancer treatments are developed in terms of efficacy, approach and outcome. •The changing face of cancer: how do we define it now? •Personalised medicine in practice – where are we now in cancer? •What are the implications from these changes for clinical trials? •What are co-clinical trials and why could they hold the key to answering unmet need in cancer treatment and beyond into broader drug development? •Modelling for the future of cancer – can this be done for personalised therapies? Medical affairs and publications teams are under increasing pressure to demonstrate effectively the success of the medical communications activities they undertake. Naturally, there are a huge number of metrics that could be used to measure and demonstrate medical communications value. The challenge is to identify, and track, those metrics that really matter, and ensure this information is interpreted effectively. This pharmaphorum webinar, which will be held in partnership with Complete HealthVizion, will look at how to measure medical communications activities, how to continue with what is successful and how to change what isn’t working. This means identifying what can be measured, both in terms of reach and engagement as well as behavioural impact, deciding what ‘great’ looks like and how best to define success. The expert panel will also look at how behavioural science can provide a framework to develop smarter communications and, ultimately, drive better patient outcomes. This Metrics to Meaning webinar will take place on Wednesday, 23rd January, at 15:00 pm GMT (10:00 EST) and will teach you how to measure the effectiveness of different types of medical communications programmes. In doing so they will also discuss the role of behaviour and the implications of this for measuring success. Communication; we all do it, it is a critical part of effective business practice and in this pharma is no exception. It is no secret that for pharma companies, face time with healthcare professionals (HCPs) has reduced drastically over the last 10 years while the cost of in person engagements has increased significantly. Like any customer their expectations for the content they receive have changed, with a focus on useful, succinct and easy to consume materials rather than the sales materials of old. So what is it that HCPs want and through this lens, what is it that pharma should be doing? The evidence points towards creating meaningful two-way conversations through multiple channels, connecting otherwise siloed touchpoints with and for HCPs in the process. For the past 40 years detailing has been the backbone of pharma/HCP communication – but what about e-Detailing? Is it just detailing on an ipad or is it supposed to be something more? How does this fit and what is possible, and more importantly desirable? To analyse the current situation and present practical insights, pharmaphorum presents a new free to attend digital debate. Working with our partner Anthill agency we have put together a panel of leading experts from Bayer and Anthill. •What is the current landscape for optimal HCP communication? •What is the future in terms of HCP channel preference? •How to activate your existing content and reach all customers willing to engage with your brand, regardless of their preference. Patient level data offers the promise of insights which can craft new and better pathways, enable development of innovative therapies and treatments, and of course identify and prevent diseases much earlier in their lifecycle. One area of particular interest is cancer. However, in trying to realise the potential, the health sector is faced with the conundrum of protecting patients’ identities, while at the same time allowing doctors access to their data and enabling industry to benefit from vital insights into the disease. This presents a paradox, as the UK has some of the best healthcare data in the world, however, accessing the data can be challenging and time consuming due to patient confidentiality checks. IQVIA brings a unique perspective to this event, having partnered with Health Data Insight to develop an innovative solution to this seemingly intractable problem: Simulacrum, a database comprised of only artificial data that is modelled on real patient data collected by the National Cancer Registration and Analysis Service (NCRAS) in England. Simulacrum has already produced identical results to the real data when predicting incidence of tumours in the population, whilst simultaneously removing any risk of breaching patient confidentiality. In this webinar, IQVIA and pharmaphorum will also provide advice to industry, patient advocacy groups and healthcare professionals on how to leverage Simulacrum, and utilise this simulated dataset to facilitate access to England’s world-leading healthcare data, while complying with regulations designed to protect and maintain individual confidentiality. Digital technology is transforming the way that healthcare is practiced and delivered, with areas like digital therapeutics forging ahead to complement traditional medical approaches and augment patient care. The development of software applications that are available with a prescription took a major step forward last year with the first FDA approval for a mobile medical application with both a safety and efficacy label. At the same time as digital therapeutics are breaking new ground there’s a whole ecosystem of digital health innovations that are also tackling healthcare issues in new and imaginative ways. From doctor-patient communication to managing healthcare costs, from healthcare monitoring to clinician workflow, the range of digital health tools and services available is rapidly expanding. We’ll be looking at how digital and traditional approaches to medicine are being combined to improve patient outcomes. Change Together will be presenting a live webinar with leading figures from the patient advocacy community, who will discuss communication and engagement as well as the different approaches advocacy groups can take to address the unique challenges of their communities. This will be helpful for all advocates, as we hear and learn from our expert panel how their organizations are bringing about change. Now more than ever before, Biotech is the engine for innovation in medicine, finding, creating and delivering ground-breaking treatments to patients. The journey from molecule discovery and development through valuation, funding, regulatory and commercialisation can be a long and complex road to travel though. These companies have to navigate a rapidly changing and increasingly complex landscape from pre-clinical valuation through foresight and planning at every stage of the asset life cycle - and at a time when Brexit adds uncertainty about regulatory approval and launch windows. Working with IQVIA, pharmaphorum has assembled a specialist panel to discuss these challenges and the most effective routes to overcoming them. On Tuesday 9th October at 15:00 BST / 10:00 EST we will present a free-to-attend online debate which will bring these experts together to deliver insight on topics such as market valuation, financing, navigating regulatory hurdles, patient engagement & HTA strategies through to successful commercialisation. There has been a myriad of reasons over the past few years to safely assume the popularity and perceived worth of face-to-face medical meetings was well and truly on the decline – from advances in technology, to funding challenges. Separate, yet complementary studies looking at global HCP preferences reveals that the medical meeting is in fact their preferred channel for scientific communications. Yet a 2018 study by Ashfield looking at global HCP preferences reveals that the medical meeting is in fact their preferred channel for scientific communications. Furthermore, HCPs exhibit consumer behaviours in selecting and attending events – which means that while these conferences offer potential engagement riches, they have to offer a specific mix of focus, value and ROI to be successful. To analyse this situation, discuss the learnings from the research and offer guidance on what a modern medical meeting needs to be we present an exclusive debate. The rise of mobile devices and apps, not to mention the involvement of non-medical technology players, is creating a wave of irrevocable digital change for medtech. It’s transforming how the sector reaches and engages with its stakeholders and customers, and in doing so provides vital opportunities to reshape a company’s commercial model. But although the sector can lay claim to some key success stories with digital technology, there remain a number of roadblocks impeding real digital progress for medtech. In this webinar we will discuss key digital lessons for medtech from other healthcare sectors, steps to take for a successful digital transformation and how to ensure ROI from digital technology. Change Together will be presenting a live webinar with leading figures from the patient advocacy community, who will debate how we can drive positive change for patients through improved education and awareness. This will be helpful for all advocates, as we hear and learn from our expert panel how their organizations are bringing about change. The panel and the topics they will be covering are as follows. • Dr. Gwen Nichols, Chief Medical Officer of the Leukemia & Lymphoma Society on coordinating the group’s groundbreaking Beat AML Master Trial, which is taking the latest research from the lab to the clinic. • Kathleen Weis, Chief Executive Officer of the Aplastic Anemia and MDS International Foundation, on the changing treatment landscape, which is bringing new hope to patients, and how her group is supporting the AML community. • Representatives from Know AML, the global AML awareness initiative established in 2017 – Gary Nolan from the Know AML secretariat and Brian Tomlinson, patient advocate committee member and Chief Program Officer at CancerCare – explaining how the project started and the role that patient advocates play in it. Helping someone live with a condition as complex as MS can be fraught with challenges. MS professionals are asked to manage multiple physical and psychological symptoms while following complicated drug monitoring regimes, all in the face of shirking resources and growing caseloads. As the burden of monitoring people on disease modifying therapies has grown, a corresponding lack of resource for symptom management has led to inequity of services for those with progressive disease. Across the UK, however, technology is being used to overcome these obstacles, by erasing geographic boundaries and expanding access. From conducting video consultations to setting up online peer support groups, digital health can and is being utilised to improve services for everyone. As part of the Quality in the Delivery of Services (QuDoS) in MS recognition programme, a panel of experts will discuss how to meet the information, support and engagement needs of people living with MS through technology. The live webinar, produced by pharmaphorum with the support of the MS Trust and Biogen, will feature the views of patients and professionals alike. The concept of integrated healthcare is not new to the UK, where it has been discussed since the late 1960s. The difference is that now it could really happen. Technology, medicine, regulation and pricing have all evolved to a point where a collaborative, integrated system is not only possible, but desirable – and the data needed for it to become a reality is now available. What does this mean for UK pharmaceutical companies that have historically focused on providing medicines and treatments? On one hand there are calls for them to change – going beyond being simply a supplier of products and moving into the role of partner, sharing risk to drive great health outcomes. On the other hand, the industry’s move into having pipelines that are largely stocked with niche products has created pricing and access questions which are yet to be fully answered. Analysing the current situation and looking for potential routes to the future, this high-level IQVIA/pharmaphorum webinar gave an update on the latest developments and debated how pharma can be a catalyst for change at a time when the NHS is under immense pressure to cut costs and become more efficient. Insight on these pressing issues was provided by a panel of influential healthcare experts that included former secretary of state for health, and NHS Confederation current chairman, Stephen Dorrell. Change Together – www.changetogether.com – will be presenting a live webinar with leading figures from the patient advocacy community, who will debate how we can drive positive change for patients through collaboration and education. This will be helpful for all advocates, as we hear and learn from our expert panel how their organizations are bringing about change. Networks of influence are shifting the decision-making process for life sciences companies. It is no longer enough to simply view the profile of a HCP or HCO to understand their value to your organization. For life sciences organizations, there is currently a gap in information, understanding, and digital access to these critical customer networks and relationships. Relying solely on internal knowledge, field experience or purchased data provides an analog, one-dimensional view of these networks. This limits companies from fully understanding key influencers, referral pathways, speaker and authorship networks and more, which once uncovered can significantly influence customer outreach, messaging and engagement. In this webinar, we’ll discuss how companies who embrace a holistic data and network analytics approach to strategic planning and execution can achieve significant competitive advantage, improved customer engagement and faster market penetration. Is your company a fully mature user of intelligence from social media, or is it still not tapping into insights? As shown in the consumer world, social media can be a very rich source of insights into customers and markets, and can provide early signals of new trends. Exactly the same is true for patient and health care provider insights, especially when used with other more traditional data sets. But understanding how to engage, and how to extract the right data to get actionable insights – and all the while complying with regulations – isn’t so straightforward. Life sciences companies in particular, want to put this new data source in context with its already broad range of metrics. Achieving this calls for a step-by-step progression towards social media maturity. pharmaphorum is working in collaboration with experts from IQVIA and Professor Andrew Stephen of Oxford University to deliver a topical debate focussed on this field, intended to provide answers to some of the conundrums the industry faces. An expert panel will provide practical advice and real-life examples of how pharmaceutical companies can develop maturity in social media intelligence. How can we create smarter, more effective communications for HCPs and patients? What can be done to challenge the status quo, apply a different mindset to communications, and deliver the best possible patient outcomes? In this webinar, we will discuss how multichannel strategy and behavioural science are natural partners in creating smarter, more meaningful, and more effective communications. The premise is simple: if we apply a behavioural mindset, we can determine where to focus our communications for the best effect, design the most appropriate multichannel strategy and content, and put the right metrics in place to measure success. The Cancer Vanguard is a bold initiative setup to take leadership in the delivery of the National Cancer Strategy – Achieving World-Class Cancer Outcomes published in 2015 with a key aim of designing and implementing new and increasingly patient centric models of care in Cancer that can benefit and be adopted by the wider national cancer system. This unique example of partnership working across the health system is focussed on the service at large, not just the pill, and uses leading edge data analytics to analyse, benchmark and visualise the current state of the cancer pathways within the Cancer Vanguard Trusts. Furthermore it encompasses multiple aspects of the service provision ranging from patient outcomes and experiences, the flow of treatment and the usage of medicine in order to inform an evidence based and patient centric approach to service redesign and resource optimisation. Pharmaceutical marketers are increasingly native multichannel practitioners, but building an effective and efficient campaign is challenging. This is also because the digital landscape, and the number of options available is still rapidly evolving. What are the best ways to choose the right channels and the right content? And how can you plan to optimize operations further by cutting down on costs and approval times? This webinar brings together experts in digital marketing with case studies from a leading pharmaceutical company to keep you up to date with the latest technology and trends and provide practical advice on how to maximize your impact. Within one hour, you’ll discover how to optimize and streamline all content-related processes within a single platform: starting with concept development and ending with the final launch. What is more, you will find out how to reuse and repurpose your ready-made content cost-effectively, as well as save time while adapting and updating content through its whole lifecycle. pharmaphorum provides a digital podium for communicating thought leadership and innovation within pharma. Our webinars bring together different stakeholders from across the healthcare spectrum to drive fresh thinking and novel solutions that deliver better outcomes for patients.